Just Who Is This Blog For? 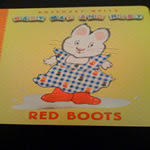 From what I can see on Rosemary Wells' website, there are four books in the "Baby Max and Ruby" collection. Maybe if you read all four of them simultaneously, you might create one semi-worthwhile storytime. Unfortunately for Ms. Wells, I judge each book on its own merits; and these Red Boots stepped in something awful. The writing causes it to teeter on the brink of destruction, and the repeat rhyming and overall pointlessness push it over the edge. Oh dear! I liked the fun pictures and goofy situation. And I like Max and Ruby! So there! I guess we'll have to agree to disagree. But, the varied opinions are exactly what we want to let people make a fully informed opinion!!! And, of course, we need to stir up some controversey for this blog. We need to nudge it to the top 100! If the book is anything like the cartoon I would never consider purchasing it or even picking it up. PS: What's your blog address again?